Any future talks over the divided island of Cyprus must be result-oriented, not just for the sake of talking, said Turkey’s foreign minister on Thursday. 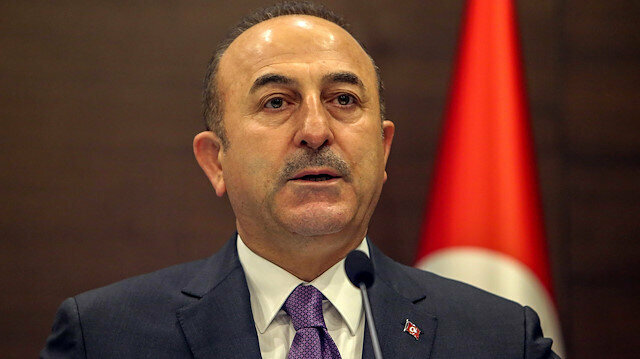 The framework of Cyprus negotiations should be specified before the start of new talks, Mevlut Cavusoglu told a press conference alongside his Greek counterpart George Katrougalos in Antalya, on Turkey's Mediterranean coast. Cavusoglu said Turkey wants a solution for Cyprus that is acceptable to both sides. Cyprus has been divided since 1974 when a Greek Cypriot coup was followed by violence against the island's Turks and Ankara's intervention as a guarantor power. The island has seen an on-and-off peace process in recent years, including the collapse of a 2017 initiative in Switzerland under the auspices of guarantor countries Turkey, Greece and the U.K.
Also speaking on energy resources in the eastern Mediterranean, Cavusoglu said Turkey has rights there under the international legal framework. "Any [energy] project which excludes Turkey is not realistic," Cavusoglu stressed. Cavusoglu said that after getting authorization from the Turkish Republic of Northern Cyprus, Turkish companies started exploration around Cyprus. "In the weeks and months to come, we will also start drilling work," he added. Cavusoglu said Turkish Cypriots also have rights over the hydrocarbon resources around the island of Cyprus. "This is accepted by everyone," Cavusoglu stressed. Cavusoglu said that while Greek Cypriots do unilateral drilling around the island, Turkey being a guarantor power for Cyprus is "more important than ever." Greece and Turkey have been at loggerheads over energy exploration in the eastern Mediterranean, particularly around the divided island of Cyprus.